I’m often asked to explain the history behind a holiday or the origin of a popular tradition. Is it based on history, tradition, or legend? The best historical sources we have on the birth of Jesus are found in two of the Gospel accounts in the New Testament. Matthew was a companion of Jesus during his ministry. Luke was not. Rather, he was a companion of Paul during his journeys, but Luke shows a detailed knowledge of primary sources, appearing to have spoken directly to Jesus’ mother Mary, perhaps during his travels while she was living in Ephesus with the Apostle John. Luke’s account contains much more detail and is four times longer than Matthew’s. 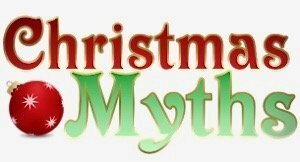 Below are 5 things frequently associated with our celebration of Christmas, which are not actually found in the Nativity story. Here’s a fresh look at what the sources say. Christmas plays and pageants feature them. Creche scenes display them: ox, donkey, lobster, Ewoks… but especially ox and donkey. However, the Nativity story makes no mention of them. While the second chapter of Luke says that Mary laid her baby in a manger, and the angel tells the shepherds that they would find the “babe wrapped in swaddling clothes lying in a manger,” there is no mention of farm angels. Perhaps a shepherd brought a lamb, but there’s no specific mention of ox and donkey. Where do we get these two animals? It is in the Gospel of Pseudo-Matthew that we find the first mention of an ox and a donkey being part of the nativity scene with Jesus. By the way, this is also one of the sources that promoted the idea of a young Mary and a much older Joseph. The pseudepigraphical Gospel of Pseudo-Matthew was written around 600 years after the birth of Jesus and is falsely attributed to Matthew, the follower of Jesus. It’s not considered canon but apocryphal and is one of the “infancy gospels” writings that tell the story of Jesus as a child. This book summarized some of the other infancy gospels including the pseudepigraphical Infancy Gospel of Thomas and the Gospel of James (both dated some 200 years after Jesus). 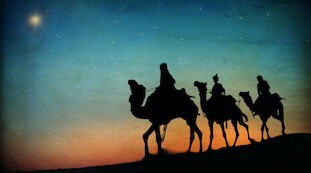 We all know the song that begins “We Three Kings of Orient are…” Great song, poor history. We don’t know how many there were but the conjecture is three gifts — gold, frankincense, and myrrh — means three givers, right? Some accounts place the number at three, but earlier traditions describe as many as a dozen in the caravan. Nothing in the Nativity story suggests they’re kings. The word used to describe them is Magi, from the Greek word magoi, the plural of magos where we get the word magic. The word is usually translated wise men or scholars. They were specialists in a variety of disciplines like medicine, religion, astronomy, and astrology. “The Orient” typically means far east, but the Nativity story says they came from “the East” which could be from Arabia to Media and Persia, but not further. Were the Magi at the birth of Jesus? The Nativity story of Luke does not mention them. The Gospel of Matthew does but places them in Jerusalem and Bethlehem some time within two years after the birth. By the way, they visited the family at a house (oikos), not a stable. Was Jesus born in a stable? The Nativity story says that he was laid in a manger, a feeding bin where animal feed was placed, but nowhere does it say it’s in a stable. Why do we think it’s a stable? The account in Luke tells us there was “no room at the inn.” The Greek word for room is topos (space,) not a room. The word for inn in the original Greek is kataluma, which could have been a multi-room lodging place for travelers, but Luke might have used pandocheion, a better Greek word for the local commercial Holiday Inn. Instead, this word kataluma is often used throughout the Bible for a guest room. Indeed, it’s the same word used for the upper room in a private residence for the Last Supper Passover meal. Mangers are found in stables. But not only in stables or barns. In the Middle East, up until recent times, sometimes they were found in houses. Two thousand years ago in simple village homes in Palestine, it was common for a home to have a single family room or a side guest room as well. The guest room would be either attached or on the roof, as described in I Kings 17. The main room or family room would be for eating and sleeping. At the end of that family room next to the door, a few feet lower than the rest of the floor or partially blocked off, would be an area designated as an animal stall for the family donkey, cow, or sheep to be taken in at night for safety or warmth. This would have been true from the time of David 3,000 years ago until the middle of the 1900s. This area may have been set into the side of a hill, or a cave or grotto (see: creche). In this area, or into the floor of the family room would have been placed a manger from which the animals could feed. The animals would be taken outside during the day. Indeed, there may have been an ox and donkey! But it’s not stated explicitly in the narrative. In the Christian tradition, this is known as the Greater Doxology or the Angelic Hymn. But the Nativity account does not describe the angels singing it. And none of them were named Herald. However, here’s what I think. Usually, when angels appear in the Bible, people are struck with fear. Except for Mary and Joseph. But these shepherds were. I suspect if I were to hear a multitude of the heavenly hosts speaking to me, it would be indescribable, awesome, fearsome. I’d not be able to describe it in any way other than singing. A Merry Christmas to us all, my dears. God bless us… everyone.